Over the past eleven years, the Carlin Nalley Foundation has awarded over $150,000 worth in scholarships. There are now eight CNF scholarships awarded to graduating Lisle High School seniors valued at $2,000 each. Applications are available in Lisle Senior High School's guidance office. Alumni, you should all be very proud to support such deserving young Lisle people as they take the next step in their lives. Thank you for your contributions, and we look forward to helping more great Lisle students like these going forward. ​Lisle High School Honors Night, May 18, 2017: Rob Taylor (CNF Secretary), Trevor Stitt (Grutzmacher Award), Kyle Belina (Mulcare Award), Erin Spangler (Fiore Award), Logan Beck (King Award), and John Bartels (CNF President). 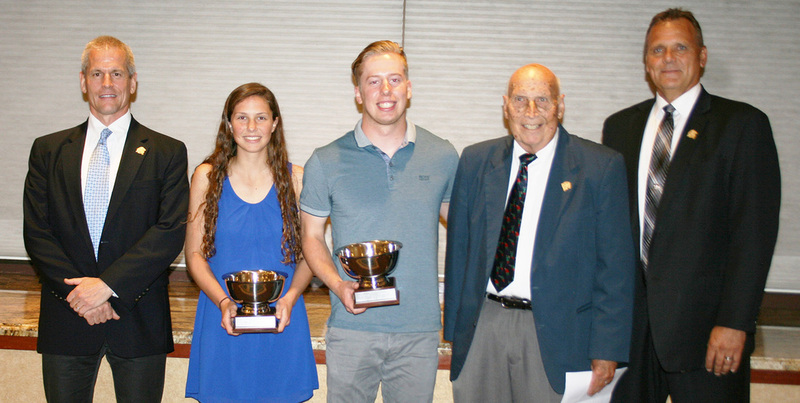 ​It was a great honor to present the Brian Piccolo and Babe Zaharias Awards to Drew Sonnefeldt and TyAnn LeGrand-Melton at the Lisle High School athletic banquet May 30, 2017, with Jay Grochowski, Bob Jones, and Rick Beato: All legends of Lisle High School. “On Wednesday, May 18, 2016, the Carlin Nalley Foundation presented $6,000 in scholarships to recognize four outstanding Lisle High School seniors at Honors Night in the high school auditorium. “The Carlin Nalley Foundation is very proud to support these outstanding student athletes with our scholarship program. We expect they will achieve great things as Lisle Alumni and be excellent examples to other Lisle High School students going forward,” John Bartels, President of the Carlin Nalley Foundation. We have honored Bob Jones and Rick Beato, pioneers in girls’ athletics at Lisle, by naming the scholarship after them. Awarded at Honors Night since 2012 in recognition of the outstanding teacher and director that inspired a generation of Lisle Thespians to excellence. Awarded at Honors Night since 2014 in honor of the dedicated industrial arts teacher who built the vocational education curriculum at Lisle and contributed to the professional success of hundreds of young Lisle men and women. Awarded at Honors Night since 2014 in honor of the exceptional teacher who set a standard of excellence in the increasingly critical field of physical science education. Awarded at Honors Night since 2015 in recognition of the Carlin Nalley Foundation’s founder, Kurt Grutzmacher, and his commitment on behalf of himself and his family to honor his mentor and coach and give back to Lisle High School.